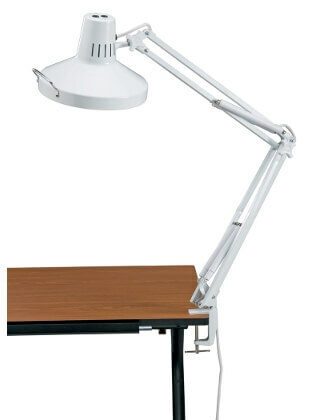 Both fluorescent and compact fluorescent lighting in one convenient drafting lamp. Two independent rocker switches operate the lights independently or together. The spring-balanced swing-arm features spring covers and a generous 45" reach which works great for most professional sized drafting tables. The lamp has large comfortable thumb knobs that make it easy to adjust the arm and shade angle. The 10" diameter heavy-duty metal shade has a stay-cool handle for easy positioning. All-metal construction with 3-prong grounded power cord, electronic ballast, and heavy-duty adjustable metal mounting clamp. Uses one energy-saving T5 28w circular fluorescent bulb (included) and one compact fluorescent bulb up to 23 to 25w CFL equivalent to 100w incandescent bulb (not included). UL listed. Best drafting lamp we could find. Very happy with quality and shipping.